Memories. Sweet memories. No. Not my memories. But, the memories of my neighbor, Sylvia. 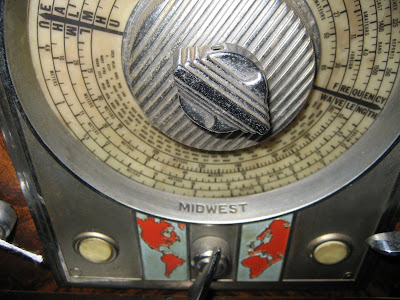 This Midwest tube console radio has been around since the 30's. Sylvia's grandparents bought it brand new. She remembers being a little girl and listening to the static and the news voices. She also remembers dancing to the music with her Papa. Sylvia and her hubby recently moved into an apartment and she told me that she had no family members who would be interested in having this piece of family history. I've often seen old pieces and wondered about the stories they could tell. This one came with sweet stories and memories. I hate that I can't keep it, but my home is filled with memorabilia from my own family. Maybe knowing about its' origins is what makes it more personal. Ya know? It's for sale at Primitiques if it happens to call to you. Any chance it still works? That was a trip down someone's memory lane I'm sure. Cool to see things such as this! You will probably think this is blasphemy. But if someone gutted out the cabinet, it could easily house some modern audio equipment inside. Maybe switch out the old speakers with a pair of Bose speakers and that little shelf in front of the dial could have an iPod dock in it. I think sometimes the history of the piece is almost more valuable the the piece itself. As always, love your blog! I like David's idea of modernizing the piece to make it useful. It is a cool piece. wow!!!!!!!!!!!!!!!!!!!!!! I haven't ever seen one of those in person!!! wow!!! thanks so mcuh for your comment, too!!! 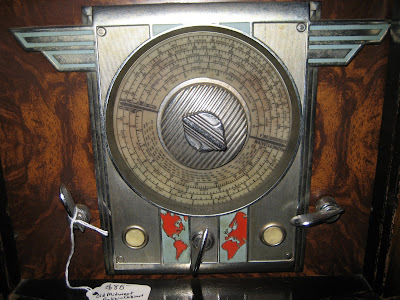 I can only imagine laying on belly and listening to the magic that poured out of this old radio. 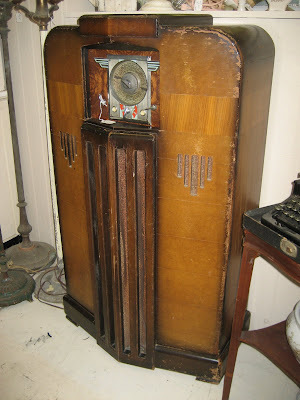 It almost pains me that I missed that age, but then I go on Old Time Radio on the internet and try to will the vibe.